﻿The Boerboel was developed in South Africa over 400 years from Bullenbijter and Barenbijter dogs bought by settlers in the early 1600’s. These dogs were bred to indigenous breeds, original bulldogs and mastiffs introduced by English settlers in the 1800’s. Only the hardiest dogs were bred and any dog who was not tough enough did not survive. This led to the rise of mastiff type dogs used by the Boers. These dogs were originally used for hunting, cattle work and guarding but more recently they have principally been used as guard dogs. 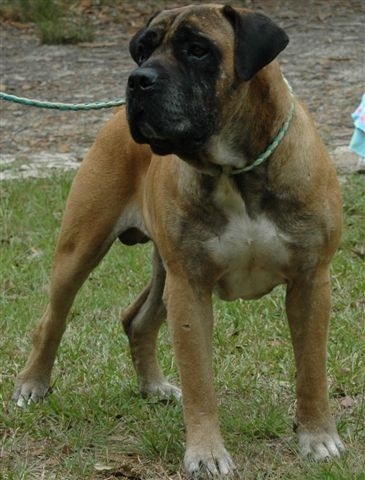 The name Boerboel literally means 'Farmer's Mastiff'. The original working Boerboels of South Africa were almost lost in the early 1900’s. Increasing urbanisation caused cross breeding with any dog who would bark. In the early 1980’s a group of people came together and formed the South African Boerboel Breeders Association. The group set out covering thousands of kilometres to find the best Boerboels in South Africa to return the original Boerboel to its rightful place among pure breeds of the world. SABBA has developed the appraisal system to ensure only the best Boerboels are being bred and the breed is now well established not only in South Africa but all over the world. Throughout history Boerboels were bred foremost for temperament and function, and as a result of this very practical and careful breeding process, the Boerboel has evolved into a loving companion with an even temperament. Boerboel Australia will continue to follow this basic rule to produce the most loyal and strong Boerboels in the world.